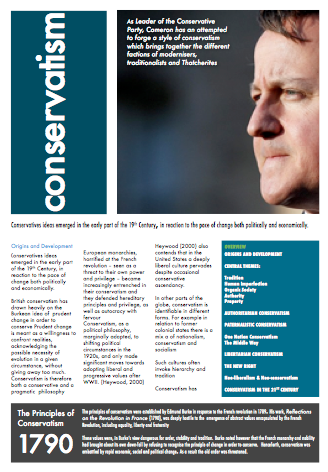 To what extent do the traditional conservative and the New Right views of society differ? Traditional conservatives adopt an organic view of society. This implies that society works like a living thing, an organism, which is sustained by a fragile set of relationships between and amongst its parts. The whole is therefore more than just its individual parts. This implies that the individual cannot be separated from society, but is part of the social groups that nurture him or her, reflecting the dependent and security-seeking tendencies within human nature. Organic societies are fashioned ultimately by natural necessity, and therefore cannot be ‘improved’ by reform or revolution. Indeed, reform or revolution is likely to destroy the delicate fabric of society, creating the possibility of radical social breakdown. The liberal New Right, by contrast, adopts an atomistic view of society that is based on the assumption that human beings are self-seeking and largely self-reliant creatures. This view differs substantially from the organicist view, as society consists only of a collection of independent individuals and their families, implying that ‘there is no such thing as society’. Such ‘rugged’ individualism implies that society should afford individuals the greatest possible scope to make their own moral decisions and accept their consequences. However, the conservative New Right remains essentially faithful to the organic model. Its emphasis on the importance of authority, established values and national identity is based on organic assumptions. ‘Conservatism favours pragmatism over principle.’ Discuss. Pragmatism is the belief that behaviour should be shaped in accordance with practical circumstances and goals rather than principles, beliefs or ideological objectives. Traditional conservatives have undoubtedly favoured pragmatism over principle. The basis for this position is the belief that human beings are intellectually limited. The world is simply too complicated for human reason to fully grasp, hence the belief that the political world is ‘boundless and bottomless’. Traditional conservatives are therefore suspicious of abstract ideas and systems of thought that claim to understand what is simply incomprehensible. They prefer to ground their ideas in tradition, experience and history, adopting a cautious, moderate and above all pragmatic approach to the world, and avoiding, if at all possible, doctrinaire or dogmatic beliefs. Principles such as ‘rights of man’, ‘equality’ and ‘social justice’ are fraught with danger because they provide a blueprint for the reform or remodelling of the world, and all such blueprints are unreliable. Pragmatism thus ensures that ‘the cure is not worse than the disease’. This emphasis on pragmatism can be illustrated by the development of the One Nation tradition. As deepening social inequality contains the seeds of revolution, conservatives came to recognise that prudent social reform was the best protection against the danger of popular insurrection. A pragmatic concern to alleviate poverty is therefore in the interests of the rich and prosperous. However, the rise of the liberal New Right challenges this emphasis on pragmatism. The liberal New Right adopts a principled belief in economic liberty and the free market, borne out of a commitment to economic liberalism and thus a rationally-based approach to politics. This, in turn, significantly altered the conservative approach to change, New Right conservatives being much more inclined to endorse radical reform on the basis of the ideological blueprint that had been provided by free-market economics. This was evident in attempts by conservatives since the 1980s to ‘roll back the state’. Some, nevertheless, explain this anti-statist turn in conservative politics in terms of pragmatism, seeing it as partly motivated by the failure of economic and social intervention to deliver sustained economic growth. How have conservatives justified private property? Property has been seen as a source of security in an uncertain and unpredictable world – something to ‘fall back on’. Property therefore provides individuals with a source of protection – hence the importance of thrift. Property ownership also promotes a range of important social values. Those who possess their own property are more likely to respect the property of others, which means that they will be law-abiding and support authority. Property therefore gives people a ‘stake’ in society. Property can be seen as an extension of an individual’s personality. People ‘realise’ themselves, even see themselves, in what they own. Possessions are not merely external objects, valued because they are useful, but also reflect something of the owner’s personality and character. However, libertarian conservatives and supporters of the liberal New Right have embraced an essentially liberal view of property as something that is ‘earned’. In this view, property represents individual merit (ability and hard work), meaning that property is an absolute right. Such a position contrasts with the traditional conservative belief that property also entails duties. To what extent does conservatism endorse tradition? Tradition refers to ideas, practices or institutions that have endured through time and have therefore been inherited from earlier periods. Tradition therefore creates continuity between the past, the present and the future. The issues of tradition and continuity have deeply divided conservatives. Traditional conservatives have placed strong stress on the importance of tradition and continuity, while the New Right, particularly the liberal New Right, has often rejected tradition and continuity. Traditional conservatives have extolled the virtues of tradition in a number of ways. For some conservatives, tradition reflects religious faith, being fashioned by God the Creator. Traditional institutions and practices therefore constitute ‘natural law’. A more widely held view portrays tradition as the accumulated wisdom of the past. The institutions and practices of the past have been ‘tested by time’, and should be preserved for the benefit of the living and for generations to come. In this view, society consists of a partnership between the living, those who are dead and those who are to be born. It has also been described as a ‘democracy of the dead’, reflecting the fact that the dead will always outnumber the living. A third advantage of tradition and continuity is that they help to generate, for both society and the individual, a sense of identity. Established customs and practices are ones that individuals can recognise; they are familiar and reassuring. Tradition thus provides people with a feeling of ‘rootedness’ and belonging. Such an emphasis on tradition has meant that traditional conservatives have usually venerated established institutions and been at least cautious about change. Change is a journey into the unknown: it creates uncertainty and insecurity. The New Right has significantly revised the relationship between conservatism and tradition, however. The New Right attempts to fuse economic libertarianism (the liberal New Right or neoliberalism) with state and social authoritarianism (the conservative New Right or neoconservatism). As such, it is a blend of radical, reactionary and traditional features. Its radicalism is evident in its robust efforts to dismantle or ‘roll back’ interventionist government and liberal social values. This radicalism is clearest in relation to the liberal New Right, which draws on rational theories and abstract principles, and so dismisses tradition. New Right radicalism is nevertheless reactionary in that both the liberal and conservative New Right hark back to a 19th century ‘golden age’ of supposed economic prosperity and moral fortitude. However, the conservative New Right also makes an appeal to tradition, particularly through its emphasis on so-called ‘traditional values’. Distinguish between neoliberalism and neoconservatism. Neoliberalism refers to an updated version of classical political economy that is dedicated to market individualism and minimal statism. Neoliberalism is justified on the grounds of the supposed economic efficiency and responsiveness that stems from unregulated capitalism and by reference to key political principles, notably individual freedom. It is primarily reflected in a desire to ‘roll back’ economic and social intervention. Neoliberalism derives from classical liberalism whereas neoconservatism is rooted in traditional conservatism. The former advances an atomistic model of society while the latter is linked to organicism. The former is libertarian while the latter is authoritarian. The former emphasises economic dynamism while the latter prioritises social order. On what grounds have conservatives supported tradition and continuity? Tradition refers to ideas, practices and institutions that have endured through time and have therefore been inherited from an earlier period. Tradition thus establishes continuity between present generations, past generations and future generations. Tradition has been justified on the grounds that it has been tried and tested by history, having proved its value to the larger society by its capacity to survive. In this view, traditions are more reliable than abstract theories as guides to action. Tradition and continuity are psychologically reassuring, generating a sense of stability and belonging precisely because they are familiar. In some cases, tradition has been justified on religious grounds, linked to the idea that inherited practices and institutions are ‘God given’. January 2011 – Essay Questions – No Essay Question set. Anarchism and free market liberalism set instead. On what grounds have conservatives supported One Nation principles? The application of such principles in the form of social reform and welfare serves the long-term interests of the wealthy and privileged by helping to neutralise political discontent on the part of the weak and vulnerable. In this sense, social reform is the antidote to social revolution. One Nation principles have a moral justification, in that the wealthy and powerful owe their social position, to a significant degree, to the accident of birth. This implies both that a high social position entails social duties, notably those linked to ameliorating poverty and supporting the disadvantaged, and that the poor are ‘deserving’, in the sense that they are not the architects of their own misfortune and cannot rectify their poverty through simple hard work and self-help. To what extent is conservatism a philosophy of imperfection? Conservatives have viewed human beings as morally imperfect, driven by non- rational drives and instincts. They have viewed human beings as psychologically limited and dependent creatures, drawn to the known, the familiar and the tried and tested. They have regarded human rationality as unreliable, the world being more complex than the human intellect is able to cope with. Traditional conservatives have been greatly influenced by these assumptions about imperfection. They have, for example, inclined traditional conservatives to place their faith in tradition, view authority and a ‘tough’ stance on law and order as desirable, and to believe that society has an organic structure. One Nation conservatives have, in some ways, modified the emphasis on moral imperfection, being more willing to explain crime and social disorder in terms of social, rather than individual, factors. The liberal New Right, on the other hand, has largely dispensed with the idea of innate human imperfection. Although neoliberals believe that humans are self- interested, they place a strong emphasis on reason and therefore on the politics of principle. Similarly, atomistic individualism implies that humans are by no means limited and dependent creatures, but have a pronounced capacity for self-reliance. However, the conservative New Right remains faithful to traditional conservative assumptions about imperfection, notably in terms of moral imperfection and therefore the need to strengthen order, discipline and authority, and in terms of psychological imperfection and thus the need for traditional values and a strong national identity. On what grounds have conservatives defended authority? Authority is a vital source of support and guidance for the people who do not know what is good for them. As such, authority arises naturally ‘from above’, as in the authority of parents over children. Authority is thus linked to paternalism. Authority is also a source of security and stability in society, allowing individuals to know ‘where they stand’ and what is expected of them. Authority thus counters rootlessness and anomie. Authority, backed up by a system of punishments, is the only effective guarantee of public order, by virtue of its capacity to constrain baser human urges and instincts. To what extent is the New Right internally coherent? The New Right can be seen to be internally divided in a number of ways, deriving from the fact that the liberal New Right draws inspiration essentially from classical liberalism, while the conservative New Right draws inspiration from traditional conservatism, specifically pre-Disraelian conservatism. This leads to deep tensions in relation to their views of human nature, society and morality. The liberal New Right believes in egoistical individualism, an atomistic model of society and the values of competition and personal self-striving. The conservative New Right believes in the psychological, moral and intellectual imperfection of human beings, embraces an organic model of society and emphasises values such as discipline, authority, deference and national allegiance. Nevertheless, the New Right can be seen to be internally coherent in a political sense and in terms of the compatibility of its goals. All members of the New Right are capable of accepting a strong but minimal state, even though the grounds on which they support a minimal state or a strong state may diverge. For instance, supporters of the liberal New Right emphasise the dynamism of a market economy and its tendency towards equilibrium, while supporters of the conservative New Right see the market economy as a vital source of social discipline. Explain the implications of the conservative belief in an ‘organic society’. Conservative have held that society has an ‘organic’ character, in the sense that it exhibits features that are normally associated with living organisms – human beings or plants. In this view, societies are complex networks of relationships that ultimately exist to maintain the whole, the whole being more important than its individual parts. In that sense, society differs from a machine, which is merely a collection of parts. Conservatism merely reflects the interests of the privileged and prosperous.’ Discuss. Conservatism has often been criticised as an ideology of the privileged and prosperous, although its supporters have strenuously denied this. Critics have linked conservatism to the interests of the privileged and the prosperous in a number of ways, including the following. By extolling the virtues of tradition and arguing against change, conservatives uphold the interests of traditional elites. Similarly, they have upheld the importance of authority and argued that societies are naturally hierarchical, hierarchy supposedly working to the benefit of all as everyone knows their ‘station in life’. One Nation conservatism has been criticised for perpetrating a form of enlightened self- interest, in that it only advocates reform in order to prevent the possibility of social revolution. New Right conservatism has also been associated with the interests of the privileged and prosperous, in that free-market economics legitimises social inequality, providing opportunities (through tax cuts and deregulation) for the rich to get richer, while the poor (through spending cuts and the ‘rolling back’ of welfare) get poorer. However, conservatives roundly reject these accusations. Supporters of One Nation conservatism argue that it attends to the interests of all groups in society, but particularly the poor and less well-off. It does this through emphasising paternalism and social duty, especially the obligation of the prosperous and privileged to care for the less fortunate. New Right conservatives argue that, being based on a belief in individualism and strict meritocracy, their ideas are orientated around all members of society and not merely the prosperous or privileged. In this view, free-market economics provides opportunities not merely for the rich to get richer but the for the poor to become less poor, as everyone benefits from the increased vigour, dynamism and efficiency of the market economy. Similarly, all members of society benefit from the maintenance of order and a tough approach to crime. On what grounds have conservatives supported paternalism? Paternalism can be justified on moral grounds. As, in the traditional conservative view, wealth and social position are largely acquired through the accident of birth, the privileged have an obligation to help those who are less fortunate than themselves. Duty is thus the price of privilege. This also implies that the poor are ‘deserving’ of support because they are not the architects of their own misfortunes. It can also be justified on practical grounds. The discharging of paternal obligations helps to bind a hierarchical society together, preventing the poor from becoming so poor that they become a threat to the established order and its institutions. To what extent do conservatives support tradition and continuity? Tradition refers to values, practices and institutions that have been passed down from one generation to the next, and so ensures continuity with the past. A belief in tradition and continuity is basic to conservative ideology, stemming from both the idea that history and past experience provide a surer guide to present conduct than do reason and analysis (tradition is the accumulated wisdom of the past), and that tradition ensures rootedness and maintains social stability. The belief in traditionalism has encouraged Conservatives to adopt a cautious attitude towards change, except in circumstances where change is unavoidable or serves the interest of the status quo (change in order to conserve). However, the emphasis on tradition within conservatism has been greatly revised as a result of the rise of the New Right, and especially the liberal New Right. This is because it is rooted in a liberal rationalism that implies a critical approach to existing institutions and practices, and so, at times, can support radical reform. On the other hand, the conservative New Right can be said to reflect a greater emphasis on tradition, especially in relation to traditional values. Some argue, moreover, that the neoliberal disposition towards change represents a form of reactionary radicalism, being based on the idea that mid-nineteenth century Britain was some kind of a ‘golden age’.